Review: Out as a reissue through the same label that put it out way back in 1971, the aptly named Dig, Friday, Saturday & Sunday appear on our shelves like nothing's happened, and we're still here wandering what the hell happened! 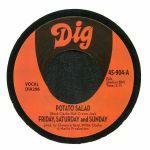 "Potato Salad" is a hard nugget to find as an original, but its also such a groovy, light-hearted tune that is a perfect example of why disco was what it was, and why it was so fun - a super recommended tune. "There Must Be Something" is equally good and powerful when played out, and although it doesn't have the same charm as the A-side, it's still a rocking soul classic.